Venice welcomes thousands of tourists every from all over the world and most often during the main events (but not only in these days), if you are interested to visit museums or other attractions, the queue at the ticket office and at the entrance could be very annoying even if you are very patient. A solution to avoid these long and endless queues could be the booking of a ticket that allows you to jump the lines thanks to a priority entry. Is it really useful to skip the line? This question is subjective because it depends to hom many days you have to stay in Venice and how much time you can spend waiting for entry in the place that you would like to visit. In our opinion, if you book early or you buy the ticket of the place that you would like to visit online, it allows you to save time. But if you don’t want to waste your time in long and endless queues you could buy the skip the queue ticket (that we propose belown), that are very useful especially during events like New Year’s Eve or Carnival, when Venice is full of tourists. The first part of the tour includes an introduction to the city and to its heart, San Marco Square. When you reach the square, the ticket allows you to skip the line and enter in the beautiful Doge’s Palace. For centuries the palace was the seat of the political power of the city and today represents an important proof of the past. The ticket also includes a passage through Ponte dei Sospiri and the entry in the Palazzo delle Prigioni, where you will discover a short instant of the unlucky life of an ancient inhabitant of the city. The last stop in the amazing Basilica di San Marco, where you can access in area which are usually not open to the tourists. You can also visit the Treasure, e very precious collection of religious masterpieces that were collected over the centuries. Finally, there is also an optional tour with the ferry boat to reach the island of Murano. Here you can visit a glassmaker and buy a souvenir to remember your adventure in Venice forever. Skip the queue in Venice and discover the beauty of the falls and the collections inside Doge’s Palace , visiting this incredible artwork and the masterpieces collected over the centuries. Admire the sumptuous golden staircase before crossing the Bridge of Sighs, where you can follow the prisoners’ footsteps to the nearby prison to see the ancient dungeons. While they crossed the bridge, was said to the prisoners to sight deeply. The bridge takes its name by this anecdote. With this memorable tour you can discover the cultural context and the importance of Venice as neuralgic center of the Europe during the Middle Age. Visit the most important attractions of Venice with this combination of 3 tours in 1. Start with a “skip the queue” entry in the incredible Doge’s Palace and take part in a tour of St. Mark’s Cathedral, in a guided visit of the city and a tour of the Grand Canal with the motorboat. The first part of the tour permit yourself to cross the famous Bridge of Sospiri, that links the palace with the nearby prison. The next part of the tour brings you in the emotional Basilica di San Marco, nicknamed “Gold Cathedral” for its peculiar golden decorations inside. Walking through bridges, churches and old palaces while the guide is telling you stories and legends about the city. Make your day perfect with a cruise along the Grand Canal with a small and comfortable motorboat. Go across the narrowest channels to better understand the venetian culture and daily life, that is apparently so far by the chaos of the city centre. The 2 main attractions of Venice are the majestic Doge’s Palace and the beautiful Basilica di San Marco. Visit both with the possibility to access areas normally closed to the public. Jump the long lines at the entrance and spend more time to visit this incredible attractions. Crossing the Ponte dei Sospiri you can follow the footsteps of the men who were accompanied to the prisons and feel the same emotions of who were closed in the venetian prisons forever. Thanks to the reservation of the ticket you will visit the St. Mark’s Cathedral where you can admire the splendour of the golden mosaics and the marble floor while the guide is explaining the meaning of the biblic scenes and the anecdotes contained in it. Finally you can have an optional excursion to the island of Murano with a private boat and see how the galls masters realize wonderful masterpieces of venetian art. Venice Box offers all you need to live as best as possible your visit of Venice. The box includes a card for public transports, voucher for priority entry in all museums of Piazza San Marco (includes Doge’s Palace) e special discounts for a lot of restaurants and shops. Convert your voucher in the city centre and start planning the itinerary to us e in the best way your stay in Venice. Consult the guide for useful informations about the most important monuments and use the map to orient yourself through the streets of Venice. With Venice Box you will never queue to catch the water bus or for enter in the museums, because because you already have tickets. Use the “skip the queue” entry for museums, included Doge’s Palace, Museum Correr, National Archeological Museum and Museums Marciano. Thanks to the possibility of using the public transports limitless (water buses and normal buses of Mestre) for all the validity period of the pass, go on board of ferry boats to move yourself through the monuments and shopping in the shops or to eat in the affiliated restaurants. The artistic scene of Venice is at your fingertips with the Venice Art Card. Save your time and money with the “skip the queue” entries to some of the most famous places of this beautiful city, like the museums in San Marco Square, the Jewish Museum and the 16 Churches. It is effective for 6 months after the first use, Art Card of Venice offers you the chance of a free visit of the most important art collections of the city. This exciting tour offers the complete visit of one of the most important Cathedral of the world. Find out the reason for the nickname of San Marco, “the golden church”, while you are travelling the wide open spaces and while you are visiting the secret areas that are usually closed to the public. Thanks to the exclusive access skip the line, you can stay inside this wonderful cathedral as long as you want. Admire the Treasure, a collection of inestimable value of masterpieces of sacred art, or the Golden Pala, that represent, with its precious stones, the maximum expression of Byzantine art. After the visit of the Cathedral, if you want, you can reach the island of Muran with a boat. Here you can visit the laboratory of a glassmaker where you can watch live the original creation of the glass of Murano, and then you can relax yourself in this quiet island. 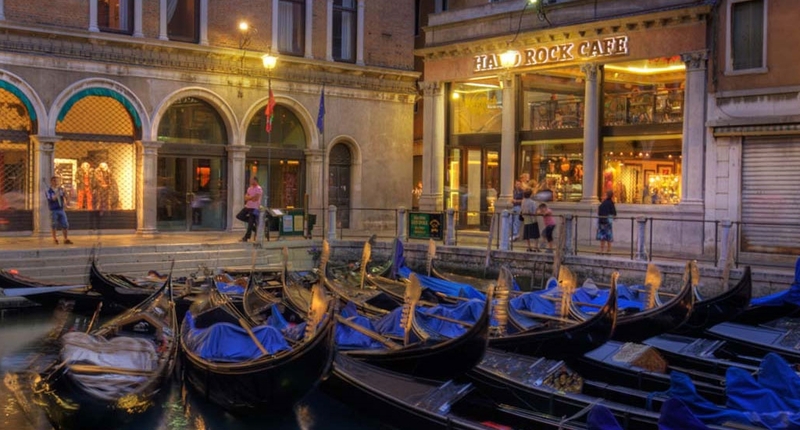 Book a priority seat and avoid the queue to enter in Hard Rock Cafè Venice. It is located in an elegant historical Palace next to the lagoon, the place received you for a delicious meal, surrounded by rock and roll’s objects from all over the world. The inauguration was in 2009, it is located close to San Marco Square and it is one of the smallest Hard Rock Cafè of Europe. But, it is the destination of a lot of people that are attracted by the large number of valuable objects of the rock and roll’s world that decorate the walls. Among them there is a dress of Shakira and an old copy of the book “A Spaniard in the Works”, written by John Lennon. Take it easy and order your meal, you can chose between Gold menu or Diamond menu. Your meal at Hard Rock Cafè includes a starter (salad or bruschetta), a main dish (cheeseburger, veggie burger, sandwich with chicken, grilled chicken, grilled pork ribs or maccheroni twist), a dessert and a drink (soft drinks, tea or coffee). Do you want to jump the line in Venice? If the answer is yes, you can choose between the alternatives that we propose, they allows you to save time to spend on other activities (especially if you stay only one day in Venice or two days in Venice and you have few time available). But if you don’t want to buy the ticket that allows you to skip the queue in Venice, at least book (or buy) on the official sites (of the various attractions you have decided to visit) your tickets to avoid the queue at least at the ticket office. Leave us a comment about the period when you have been in Venice and what’s your opinion about the use of this voucher during your holiday in Serenissima, perhaps having booked tickets online in Venice!